One of the things that I regret not sharing much of on the blog is our recipes for canning/freezing vegetables and sauces. It’s such an afterthought even though it’s something we do every fall to help preserve the harvest. My goal this coming summer/fall is to share more of our preserving tips and recipes to help you preserve the harvest as well! Anyhow, we canned some roasted red peppers last fall and one of my favorite condiments in the world is romesco sauce. It’s a smokey sauce that has a lovely kick from garlic, roasted red peppers, smoked paprika and toasted almonds. It’s lovely added to pasta, smeared on a slice of toasted baguette, paired with meat or in this case, tossed with some roasted potatoes. There are many different recipes out there but I’m partial to the simplicity of our version. I hope you all enjoy these roasted potatoes as much as we do. Don’t skip the soft boiled egg–it’s the perfect addition and makes this filling enough to be a complete meal. We enjoyed these roasted potatoes with a few IPA’s while hanging out on the deck in the warm spring sunshine. We’re loving this spring weather here at the farm! Place all the ingredients for the romesco sauce in a food processor and process until smooth. Taste test and adjust seasonings as needed. Preheat the oven to 400F. Toss the potatoes with the oil, salt and pepper and roast until lightly browned and tender. About 25-30 minutes, tossing halfway through cooking. While the potatoes roast soft boil your eggs by placing them in boiling water and cooking for about 6 minutes. Remove from the heat and place in a bowl of ice water. Toss the roasted potatoes with the romesco sauce. 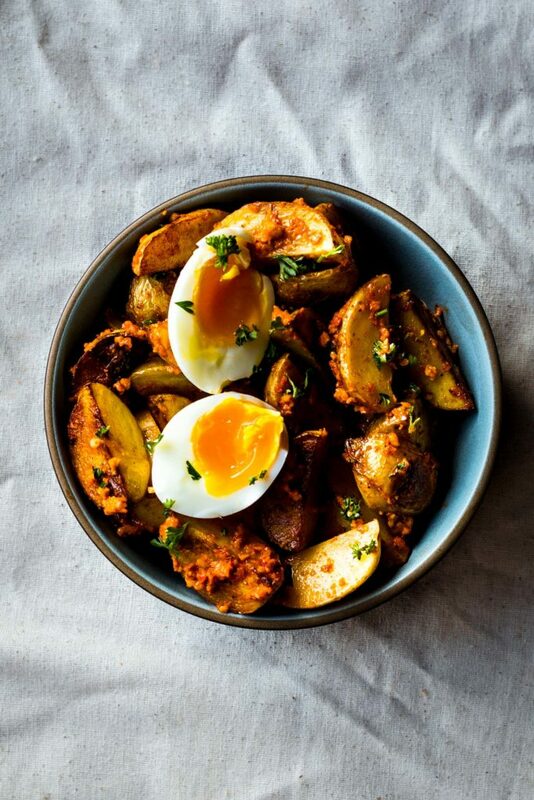 To serve divide the potatoes between bowls and top with the soft boil egg, parsley and a sprinkle of parmesan cheese if desired. Glad to hear you will be focusing on preserving the harvest and some of you great sauces. Love your dressings and sauces. They are yummy and versatile. Like culinary money in the bank. Have a great season. I’m so excited to see you’ll be sharing canning and freezer recipes! Can’t wait. Thanks! I love canning and interested in anything you share from the farm.. I can easily adapt your recipes to things available locally..inspiration! Romesco sauce is one of my favorites too. It makes any dish feel special. and hearty. I love your simple combination of potatoes, eggs, and the sauce. Perfect weeknight dinner. What’s with all the eggs? Like the veggie variety you used to have. Did that go away because you landed (sold out) a book deal?! LOVE that you gave us that romesco sauce recipe – didn’t really know the ingredients and these sound fabulous. When I first saw the photo of this dish – I just wanted to start eating, right then and there!! My hubby just made this tonight and it was divine!!!! Well done. Simple and incredibly flavorful!